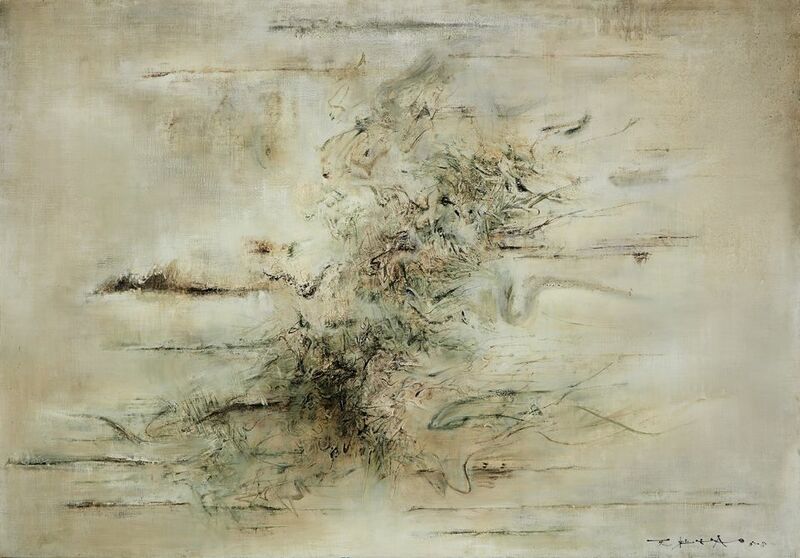 Sotheby’s announced on Tuesday (29 January) that it would offer Zao Wou-Ki’s large-scale 1958 untitled oil painting in its Hong Kong Modern art evening sale on 31 March, where it is poised to bring in HK$60m-HK$80m ($7.7m-$10m). Though certainly no small sum, this estimate seems almost conservative given the recent boom in the market for the Chinese-French abstract artist, especially in light of the work’s illustrious provenance—it is being deaccessioned by New York’s Solomon R. Guggenheim Museum, where it has been since it was gifted to the institution by the original buyer in 1964. Known for his immersive non-representational oil paintings that blend Eastern and Western art making techniques, demand for Zao’s work has gone through the secondary market roof since his death in 2013. A posthumous uptick in prices is not unusual, but according to Emilio Steinberger, a senior partner of Lévy Gorvy gallery, which began working with the artist’s foundation in 2016, says that “in the period of time we worked with the foundation, we have noticed that the interest in his work globally has greatly increased”. According to the ArtPrice database, Zao is the number one Chinese artist outside of China by 2018 auction turnover, bringing in an average of $31.25m. To chart the rise of the market value for his work in recent years, one has only to look at the artist’s painting, 23.05.64, which was auctioned for the first time in 1991 at Paris’s Breist auction house for $78,000. Less than ten years later, it sold for three times that amount when an Asian collector bought it for $251,600 in December 2000 at Calmels, also in Paris. Last September, the same work sold at Sotheby’s Hong Kong for a $11.5m—more than a 4000% increase in value. Yet that number was quickly dwarfed a month later when Zao’s monumental tryptic masterpiece, Juin-Octobre 1985, set three auction records in one night—including a new high for a work made by an Asian painter—when it sold for $65m, also in Hong Kong. Though the buyer remains unidentified, the work’s consignor, Taiwanese manufacturing executive Chang Qui Dun, made 28 times the original price paid for the work—he reportedly bought the triptych in 2005 for $2.3m, according to Bloomberg. A protracted legal battle over Zao’s estate between his third wife, Françoise Marquet, and his son from his first wife, Jia-Ling Zhao, may well have fuelled secondary market prices for his work as the rights to his unsold paintings remained in limbo, stymying supply. But since a French court’s ruling in favour of Marquet in 2017, the artist’s work has become increasingly ubiquitous on the marketplace. In the last year, Zao’s work has been popping up at major art fairs the world over, most recently at Brafa Art Fair in Brussels (through 3 February). Dealer Kamel Mennour will have stage exhibitions of the artist’s ink and watercolour paintings in both its London and Paris locations in February and March, marking the first solo presentation of his work in a gallery since the settlement of his estate. Perhaps the increase in availability of Zao’s work has tempered Sotheby’s estimate for the latest work by the artist to hit the auction block. The untitled painting for sale this spring comes from the artist’s “Oracle Bone” period during his first years in Paris, which references an ancient Chinese practice of inscribing oracles on animal bones. The US democratic judge Samuel Rosenman, the first White House counsel, donated the work to the Guggenheim in 1964, though it has been rarely, if ever, exhibited. The museum declined to comment on the deaccession and did not confirm when or if the work has been previously shown, and it is not listed in its digital collection. It’s the first time the work will hit the auction block and its sale will benefit the museum’s acquisition fund. In 2013, Sotheby’s Beijing sold a comparable painting called Abstraction (1958) from the collection of the Art Institute of Chicago for $14.7m. Since then, the market of the artist’s work “has been going from strength to strength”, says Felix Kwok, the auction house’s senior specialist of Modern Asian art in Hong Kong. He adds, “This painting boasts the same distinguished museum provenance and will no doubt generate interest by collectors worldwide”. The Guggenheim has recently been focussed on growing their Chinese Modern and contemporary art collection under its Asian Art Initiative, although a representative for the museum declined to comment on the deaccessioning of this particular work or whether the proceeds would be used to acquire additional works by Asian artists. Of Sotheby’s drumming up the work’s museum provenance, Steinberger says: “As with any internationally recognised artist, a strong provenance can, of course, add [to the] desirability of a particular work. And the fact that it has such a strong provenance and not been seen in public for some time will greatly enhance the interest in the piece.” The work will be on view at the auction house’s New York location from 5 to 10 February ahead of the sale.